I’ve recently had occasion to gather and read several decades of old AB Bookman’s Weekly’s and AB Yearbooks (more on this in another post). But last night I came across the ad to the left (click for full view) from 1984’s AB Yearbook and was reminded that in only about five weeks, dozens of booksellers (with the occasional collector and librarian) will gather again in Colorado Springs for the annual Colorado Antiquarian Book Seminar, also known colloquially as “bootcamp for booksellers.” The Seminar has been held continuously for the past 32 years and provides “an opportunity for leading specialists to share their expertise and experience [...] in a comprehensive survey of the rare book market, both antiquarian and modern.” For those wanting more details, a list of highlights as well as a schedule of this year’s events and topics can be found on the Seminar’s (recently redesigned) website. Perhaps even better however, of the Seminar’s more than 2000 graduates, many over the last few years have shared their experiences online. From fellow FB&C blogger Chris Lowenstein’s ringing endorsements to day-by-day wraps-ups of the last two years, there are numerous accounts of Seminar experiences from many points-of-view, and as far as I can tell, all overwhelmingly positive. It is no exaggeration to say that the Seminar easily saved me two or three years of effort and learning on my own. Between the advice given, information bestowed, contacts made, and inspiration received it is an investment in time and money well worth making. Indeed, in the years since I attended I have made back what I spent on my trip many times over simply through the books I’ve sold to people whom I met via the Seminars. In other words, the Seminar is well worth the expense of attending. And then some. But while it’s true the Seminar was the best thing I ever did for my business, it is perhaps even more true that it was quite simply one of the most enjoyable week’s of my life. I have rarely laughed harder or had a better time than I did in Colorado. I made close friends I have kept to this day. And it was a joy to be among so many people who share the same -- rather esoteric -- passion. So go. It’s not too late to register. Go to make more money (if you’re a bookseller). Go to deepen your knowledge and appreciation of books and their history. Go to make friends with people who love books as much as you do. Go to learn from some of the best in the business. Seriously, just go. I've recently had occasion to gather and read several decades of old AB Bookman's Weekly's and AB Yearbooks (more on this in another post). 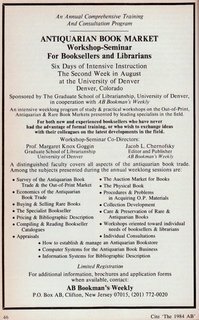 But last night I came across the ad to the left (click for full view) from 1984's AB Yearbook and was reminded that in only about five weeks, dozens of booksellers (with the occasional collector and librarian) will gather again in Colorado Springs for the annual Colorado Antiquarian Book Seminar, also known colloquially as "bootcamp for booksellers." The Seminar has been held continuously for the past 32 years and provides "an opportunity for leading specialists to share their expertise and experience [...] in a comprehensive survey of the rare book market, both antiquarian and modern." For those wanting more details, a list of highlights as well as a schedule of this year's events and topics can be found on the Seminar's (recently redesigned) website. Perhaps even better however, of the Seminar's more than 2000 graduates, many over the last few years have shared their experiences online. From fellow FB&C blogger Chris Lowenstein's ringing endorsements to day-by-day wraps-ups of the last two years, there are numerous accounts of Seminar experiences from many points-of-view, and as far as I can tell, all overwhelmingly positive. It is no exaggeration to say that the Seminar easily saved me two or three years of effort and learning on my own. Between the advice given, information bestowed, contacts made, and inspiration received it is an investment in time and money well worth making. Indeed, in the years since I attended I have made back what I spent on my trip many times over simply through the books I've sold to people whom I met via the Seminars. But while it's true the Seminar was the best thing I ever did for my business, it is perhaps even more true that it was quite simply one of the most enjoyable week's of my life. I have rarely laughed harder or had a better time than I did in Colorado. I made close friends I have kept to this day. And it was a joy to be among so many people who share the same -- rather esoteric -- passion. So go. It's not too late to register. Go to make more money (if you're a bookseller). Go to deepen your knowledge and appreciation of books and their history. Go to make friends with people who love books as much as you do. Go to learn from some of the best in the business. Seriously, just go.